Robert Frank Scarpitto was born January 7, 1939 in Rahway. Undersized at 5–11 but solidly built, Bob was a superb all-around athlete. His star shone brightest on the gridiron, where he excelled as a runner, receiver and kicker for the Indians of Rahway High. Bob earned a scholarship to Notre Dame, where he played halfback and punted for the varsity in 1958, 1959 and 1960. Among his teammates were Myron Pottios and Nick Buoniconti. Bob was the team’s top receiver as a junior and a senior, catching a total of 13 touchdown passes. Bob also led the Fighting Irish in points those years, with 48 and 30, respectively. As a junior, he had the distinction of leading the team in punting and in punt returns, averaging 16.9 yards per return. He also averaged over 20 yards per kickoff return that season. 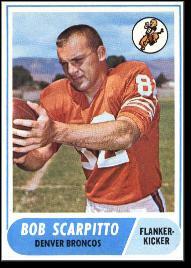 After graduation, the San Diego Chargers selected Bob in the ninth round of the 1961 American Football League Draft. The team’s general manager, Frank Leahy, may have had something to do with that. Leahy had coached Notre Dame in the 1940s and 1950s and had seen Bob in action many times. Bob got into seven games as a rookie. He caught two touchdown passes, and saw action in the AFL Championship, which the Chargers lost to the Houston Oilers. In 1962, Bob joined the Denver Broncos. He played flanker and caught 35 passes. He would continue as a reliable second-string receiver for the team for the next six seasons. In 1965, the Broncos asked Bob to replace Jim Fraser as the team punter. For the next four years, Bob was unrivaled in the AFL. From 1965 to 1968 (Bob played for the Patriots in 1968, his final pro season), he averaged over 40 yards a punt, leading the league with marks of 45.2 in 1966 and 44.9 in 1967. He launched the league’s longest punt each season from 1965 to 1968, including a jaw-dropping 87-yarder in his final season. In 1966, he gained All-Star recognition for the one and only time in his pro career. After football, Bob and his family moved to the West Coast. He retired in the Carmel Valley.